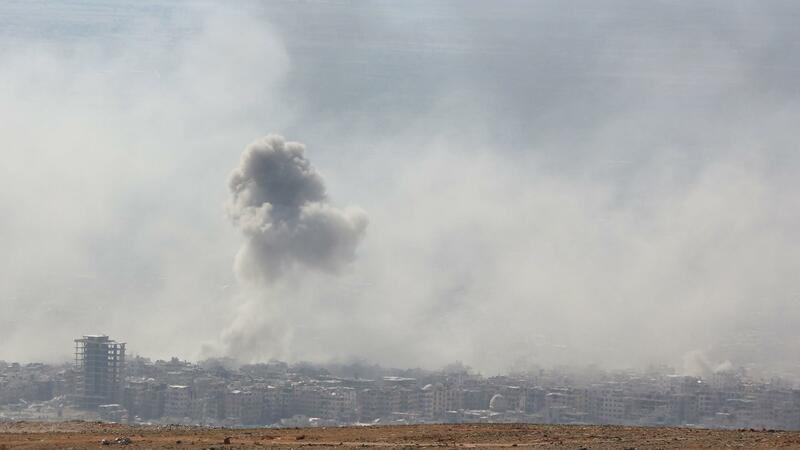 Smoke billows above Douma, Syria, on Saturday. The White House says President Trump is weighing military action following an alleged chemical attack in the town. The president has the authority to deploy military force in the interest of self-defense. But outside that rationale — and the White House has not made that case — the president's legal authority becomes murkier. After the United States' missile strikes against Syria last year, a group made up primarily of former Obama administration lawyers, "Protect Democracy," filed a Freedom of Information Act request to demand the legal justification for the strikes. When the government did not comply, the organization sued. Uncovered as part of the subsequent litigation was the existence of a seven-page memo produced by the White House on the day of the 2017 Syria strikes. While one page containing background is classified, the remaining six pages featuring the White House's legal rationale is not. On Monday, as the administration signaled that strikes could be imminent, Protect Democracy filed an update with the court asking for a speedy resolution of its lawsuit. The Trump administration argues that the memo was prepared for the purpose of giving advice to the president and says in a court filing that disclosure could "chill the open and frank expression of ideas." The White House did not respond to a request for comment from NPR. Sen. Tim Kaine, D-Va., who has become a leading voice advocating for Congress' responsibility to approve military action, said the president should release the memo before any strikes. "Without congressional authorization, any military action President Trump takes in Syria that isn't in self-defense is illegal," Kaine said in a statement on Wednesday. Continued Kaine: "And while he's at it, he should also release the secret legal memo that reportedly justifies the airstrikes on Syria last year — which clearly haven't deterred Syrian leader Bashar Assad — and that the president is apparently now using as precedent for unilateral military action." Kaine told NPR this week that while in general he would support airstrikes against Assad, he does not believe that the president can unilaterally bomb a sovereign country like Syria without congressional authorization. Another Trump critic, Democratic Sen. Chris Murphy of Connecticut, told NPR that although he condemns the Assad regime's reported chemical attacks, there are obvious limits on Trump's authority to act. "We're a nation of laws, and we have a Constitution that says very clearly that it's Congress who gets to decide who the United States can fight wars against," Murphy said. "The president can take military action without congressional permission if the U.S. is attacked or is at risk of imminent attack — but that's not what happened here," he said. "If the president thinks he found a loophole that lets him attack other countries without authorization, he needs to show that justification and make that case to the people." Debate over the privileges and responsibilities of ordering military action have dogged presidents since the Vietnam War. In 2011, for example, Republicans complained that Congress hadn't been adequately consulted about the military operations that President Barack Obama ordered against Libya. Later, when confronting the crisis Syria, Obama found himself painted into a corner after having declared that the use of chemical weapons would cross a "red line." When Assad used them, Obama decided that he had the authority to order an attack against the Syrian regime, but also decided, out of principle, to ask Congress to authorize it. Lawmakers did not; the measure went nowhere. The United States joined a coalition of nations in attempting to remove Syria's chemical weapons, which ultimately did not stop such attacks there. At the time, Trump demanded that Obama secure the approval of Congress.